This article describes how to integrate Daminion and Synology Photo Station so that Daminion provides the back-end library management capabilities, and Photo Station the front-end web publishing service that allows you to share your photo library with friends and family. The solutions I describe here are those that work for me. They have been developed by trial and error, and with lots of interaction with Daminion and Synology Support Desks. I hope they help those of you who are also Daminion and Synology users. If you have better ideas I’d love to hear them. I cannot guarantee that the techniques will work for you and, as with any valuable data, you must proceed with caution, try things out on test data before you commit to using live data, and be sure to have a good backup strategy in place. Every setup is different; I take no responsibility for any issues you may encounter, although I'll be happy to help if I can. My needs are not complex and probably have a lot in common with other hobbyist photographers. Manage an expanding library. At 20,000 images it's modest in size but no less complex because of that, with images going back to 1904, and hundreds of people and locations. And it is growing. Make it available on any device, anywhere, any time. As I already had a DiskStation for my music library I saw no reason to pay a hosting fee for my photo library. And many DiskStation users buy one because of privacy and security concerns around commercial cloud solutions. For years my photo library had been stored on my PC’s hard drive and backed up to my Synology DiskStation. 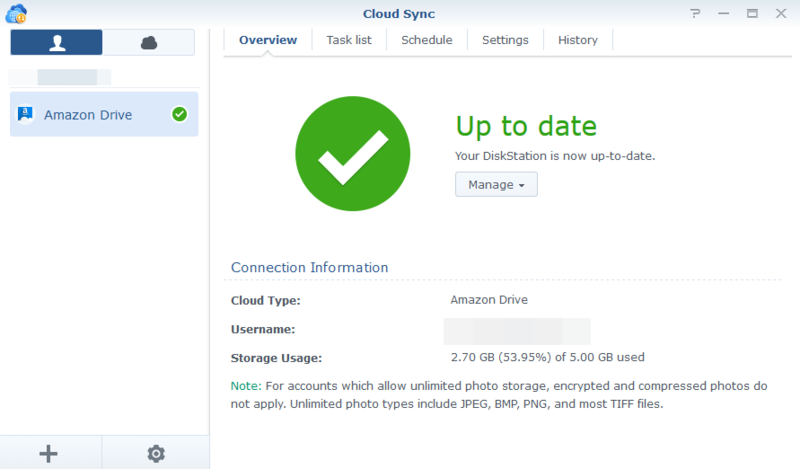 Could I make the NAS drive the home location for my library and use Synology’s Photo Station app as my private cloud publishing solution? Only one way to find out. I moved the library over to the Synology DS216j, into the dedicated /photo location and waited while the file indexing service did its stuff. The library was 20,000 images and about 95 GB data so the indexing took a while. Later upgrades to a DS 716+II and then a 916+ made a dramatic difference to the indexing - 70 times faster! 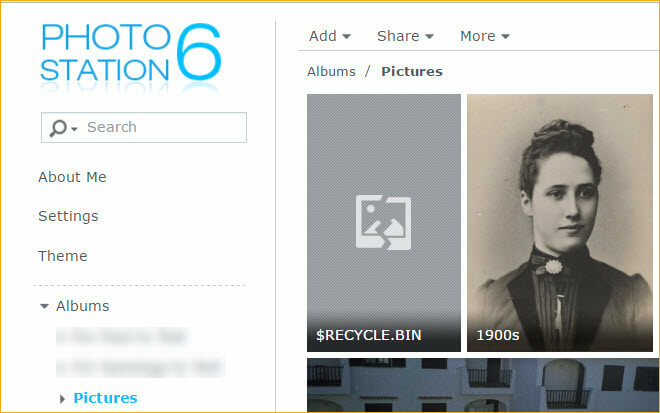 Photo Station’s web interface is excellent with lots of ways to organise, display and share photos. It's search function is brilliant and while it does not support all the Daminion metadata tags or hierarchical keywords, it is far more capable than any of the online services. In fact, when compared to the cloud offerings of Microsoft, Google, Dropbox and the rest, Photo Station stands out from the crowd, and with PC, Android and iOS apps it covers all the platforms that I need. So, it was clear that this was the cloud publishing solution to use - and the bonus? It’s a free app that comes with every Synology Disk Station. I am already invested in the Synology platform for data security. In effect, my private cloud solution for photos is free. No monthly hosting charges, and I have direct control of my precious files. Having selected a really great web platform that will let me publish photos to my family on various devices 24/7 it was now time to see how well it handled metadata and general library management functions. For the casual photographer it’s OK. You can tag People, Locations and Keywords, with limitations. You can’t group edit People tags, they have to be done one by one by lassoing a person’s face and then adding their name – a tedious process. Performance is an issue too, depending on the Disk Station's CPU and RAM. Tagging individual files is not a problem, but group updates take significantly longer through the web, especially as there is no background service to handle them while you get on with the next task. Photo Station has a great web UI/UX but it's metadata management capabilities are limited - something better is needed to manage the library. Daminion has no photo editor but it lets you hook an editor into the app so you can call it directly for a selected image. No problem, I can use Photoshop Elements Editor for that. Daminion is great for collaborative working across teams but to the individual user the big advantage of Daminion is its metadata handling capabilities. 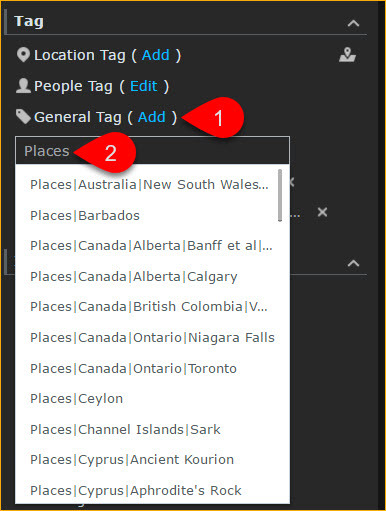 There are so many out-of-the box possibilities with support for hierarchical tags for People, Places, Events and Keywords plus others of increasing technicality too numerous to mention (see image on left for a full list.) I also became quite excited at the demo of the Daminion web server, but it doesn’t run on a Synology NAS so my excitement soon disappeared. In theory a Virtual Windows Machine might have worked, but the hardware requirements were beyond the ability of my DiskStation. I was pleased to see that the app allowed you to natively edit the image creation date – useful when you are handling scanned images from the days of film and don't want image sorting to be hampered by data that reflects the date an image was scanned, instead of the date the original picture was taken. Support is excellent, especially if you go for a paid-for licence (starting at $49.95 for a lifetime licence for up to 75K images for the standalone version, as at Sep 2018 - you can check it here). Not only is Support incredibly responsive, the User Forum is excellent too and, unlike vendors such as Microsoft, you get quick, helpful responses! You can give Daminion a free trial on a library of up to 15k images by visiting the download site. Look for the Standalone version. There is an Enterprise Server version but it is aimed at small businesses so it is designed to run on a Microsoft server, not on a NAS. Synology Photo Station has some limitations but that doesn't stop it being a great front-end companion to Daminion's back-end library management capabilities. If there was a Daminion Synology Package as an alternative to the IIS server web UI, along with PC and mobile apps, to match Synology’s offering then that would be a brilliant solution for hobbyist photographers but it's not in the Daminion roadmap. The Daminion / Photo Station combo is therefore as good as it gets, and it's a pretty good combo if you do it right. 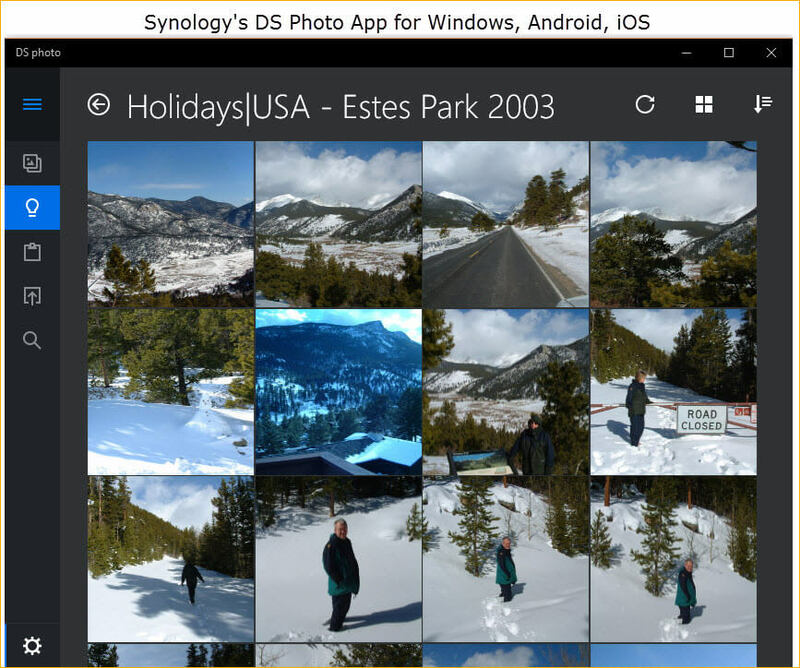 If you already have a Synology DiskStation ,the Photo Station app is one of the free apps in the Package Center. If your library is less than 15,000 images Daminion standalone is also free. Up to 75,000 images will only cost $49.95 and unlimited is 5¢ short of $100. The spec of the DiskStation will be a factor when your library is large due to the indexing load. Performance on a 216j with a 20,000 item library was acceptable but not brilliant. It's definitely a power hungry app that benefits from a higher end DiskStation such as a DS718 or DS 918. Synology Moments is much less power hungry but is not (yet) suitable for large shared libraries. Before you move the library from your local HDD you might want to take a moment to review and possibly change your folder structure. The reason I use a date based scheme is that many import routines can exploit the date and time of new images to place the content in the respective folders and can even create them for you. Other users have complex folder schemes based on people or events or time or a combination. 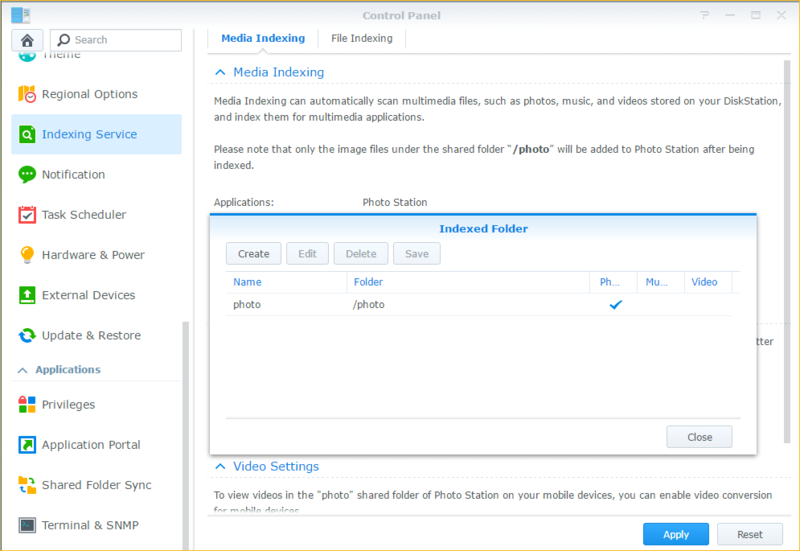 Photo Station requires the image library to be stored on your DiskStation in a specific share If it's not, now is the time to move it. If it's already on the DiskStation it needs to be in the correct location. Before you move images on or onto the DiskStation, you should check the status of the File Indexing service. Turning it off is a good move, especially on low end DiskStations This will prevent the indexing service from performing a heavy lift operation until you are ready. Delete the entry for /photo. We will re-enable it later. Within the /photo folder you can organise your images into whatever sub-folders you want. Now would be a good time to clear out any unwanted images and any empty folders so you only transfer what you need. 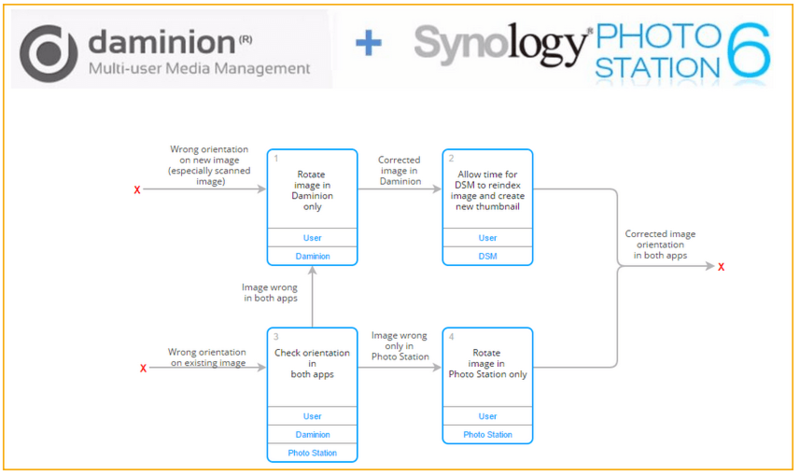 Synology provides tools to speed up the process of importing and indexing images - Photo Station Uploader and DS Photo. The benefit of these tools is that they perform the thumbnail creation task using your PC's CPU instead of the DiskStation's. But for our purposes they are not useful because the first thing you are going to do once you have uploaded an image is check, edit or add to its tags. As soon as you do that, the DiskStation will re-index the files and recreate the thumbnails. So offloading thumbnail generation during upload using your PC is a waste of time,. The simplest way to transfer files to your Synology DiskStation is to use Windows File Explorer. Use copy, not cut and paste so you have a backup in case anything goes wrong during this or later steps. If you prefer you can skip this step and move the files using Daminion, during the process of creating the catalog, which is what we will be doing next. Also see the section on Synology Drive, because once the initial upload has been done, syncing the local and NAS folders is a useful way of speeding up future updates to the library, and improving file read / write speeds and connection resilience. 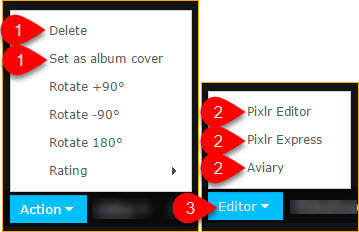 How to edit Daminion's preferences to meet the needs of Photo Station. How to create a catalog. The concept of the Daminion Catalog and how many you need. How to import your images. It doesn't deal with installing Daminion because it's a Windows application, and uses the standard Windows installation procedure. Daminion will run OK with its default settings but there are a few useful tweaks you should make. Preserving (i.e. not changing the existing) the file modified date is important as that date affects the display order in Photo Station and other photo display apps, especially Windows Photo. 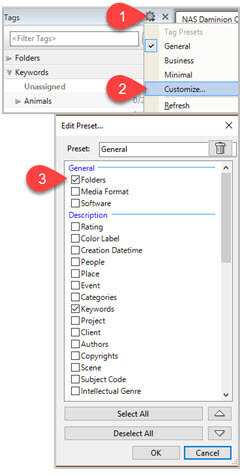 For our purposes editing the image metadata does not represent a material modification of the file and is no reason to change the display order. The image remains unchanged. For your first import it makes sense to have this option turned off IF you are happy with the tag structure from your previous app, and you will be spared the process of 'approving' them in Daminion. Once your initial import is done of is you are not happy with your existing tag structure, you should make sure this option is turned ON, so that your existing tag structure is not changed when new files are imported. New tags will still be imported but they will be flagged so you can decide what to do with them. After you save the metadata changes on an item in Daminion, the process that follows is actually in two stages. The tag updates are written to the Daminion Catalog. The changes are written to the metadata fields in the image. As soon as the Disk Station sees a file modification it will re-index that file and create a new thumbnail. Having auto-sync turned on is normally good, but when you are setting up a new library, doing big metadata updates on an existing library, or doing many small sequential tweaks to the metadata it can result in the same file being reindexed multiple times, which causes extended processing time on the Disk Station. In this case, it is a good idea to turn OFF auto-sync until you are done with your metadata changes. You will find the option at the top right of the image display panel. What is a Daminion Catalog? It's a collection of media files, details of which are stored in an indexed database to enable rapid search and selection. Long answer: ONE. Daminion can handle ultra large catalogs with ease. In a discussion on the User Forum, a user with a library of just under 1 million images asked how many catalogs they should have, and the recommendation was one. The primary reason for this is tagging. Tags are specific to a catalog. 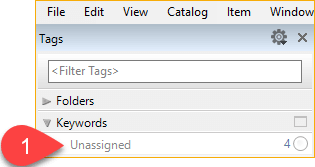 If you have multiple catalogs that use the same tags you will have to maintain those tag libraries separately in each catalog. Nor can you search across multiple catalogs, so finding an image that is only present in one catalog would require you to repeat the search for each catalog. Before you start, check that your PC is not set to sleep after an idle period. If it is, disable that for now so that the import process does not get suspended. Creating a new catalog is exactly the same as creating any new asset in Windows, (1) File (2) New Catalog. For clarity you might want to place it in a dedicated 'Daminion' folder (3). Give the catalog a meaningful name (4). 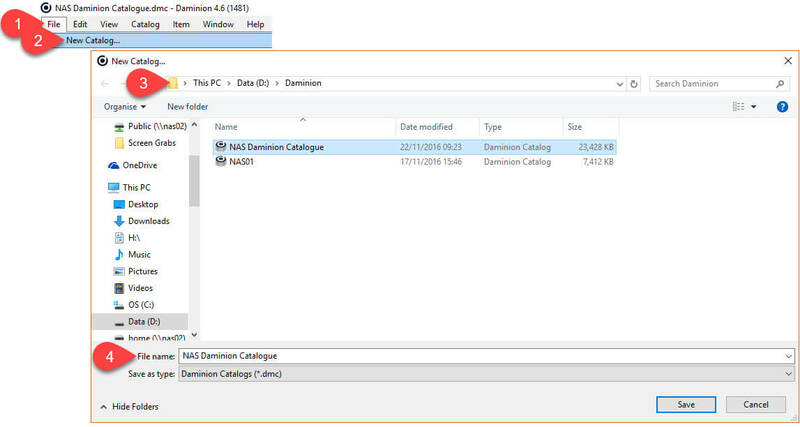 The catalog will load automatically when you start Daminion, so you may never need to think about its name again, but if some day you are browsing your hard drive in Windows Explorer you may encounter the file and wonder what it is for. The File > New Catalog command will ask you for a source location for the image files to be added to the new catalog. If you skipped the earlier step to move the images to the Disk Station then it's now time to copy the files into their new location. In this case, choose the second option at step 5 'Copy files to a folder and add to the catalog.' It is recommended that you do NOT check the box 'Delete source files after successful transfer.' If the import process fails for any reason, deleting and recreating a catalog is easy; much easier than restoring deleted files. The import will take a while depending on the size of your library, the power of your Disk Station and your connection speed. 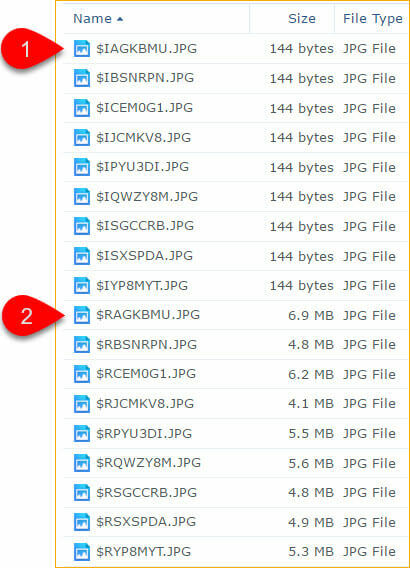 This is not a detailed set of Photo Station installation instructions – there is plenty of material out there on that topic, especially on the Synology Knowledge Base. But sometimes the knowledge base falls short in that it explains how to do something but not why it is necessary, and it usually assumes a level of knowledge which may not be present in a hobbyist user. You want to expose your photos to people outside your home network, even if that is just yourself when away from the house. 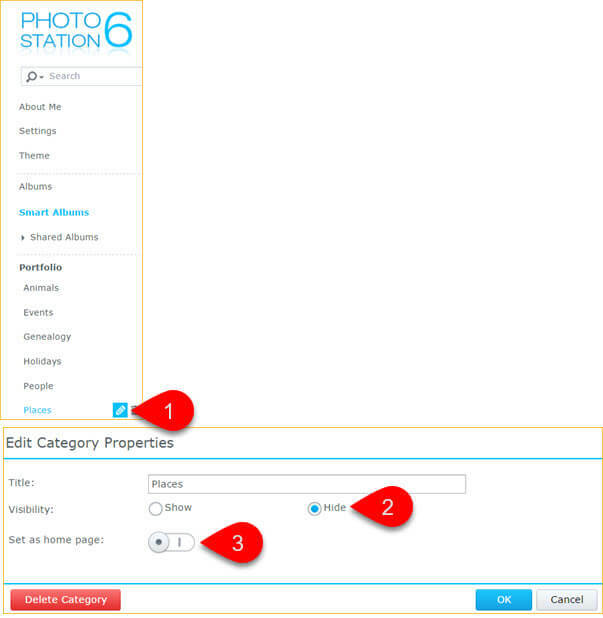 None of the following instructions is specific to using Photo Station with Daminion; they are generic settings for any Photo Station installation. Before you install Photo Station there are some prerequisites. I want direct control over the ports that are being opened. If you have more than one DiskStation, you have to do it manually to stop the units competing for the same ports. Any existing port forwarding rules will be overwritten during the process which may not be what you want. The EZ-Internet wizard will guide you through all the difficult work including assigning a QuickConnect ID and setting up port forwarding rules on your router, if it is a supported router. You can check the compatibility of your router using Synology’s Tool. If your router is not supported there is plenty of training material for your specific router on the internet. 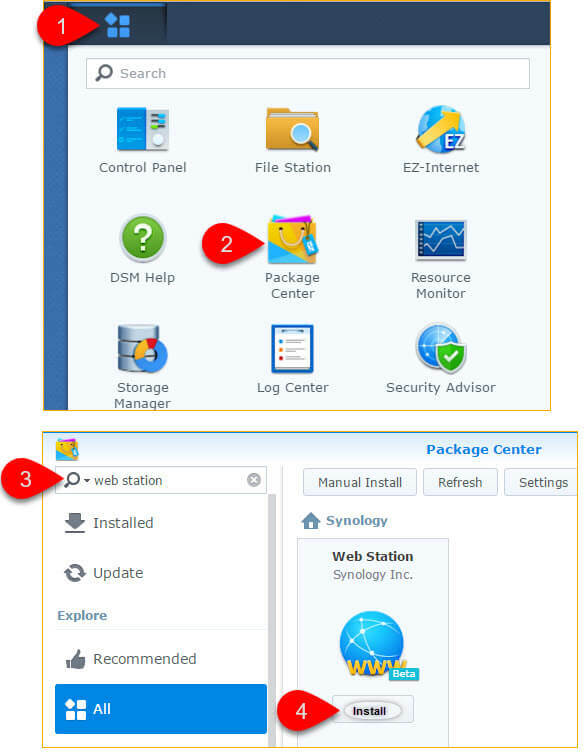 Go into Package Centre, search for Web Station and install it. Be patient. It can take a while, especially on budget models. This section deals with how to configure Photo Station There are some areas where Photo Station needs to be tweaked to work best with Daminion. Choose Settings on the left hand panel. In a later step you will see how you can remove features such as a DSM desktop, File Station access and a Home Directory from Named Users, leaving them with a working Photo Station account but no access to your Disk Station. 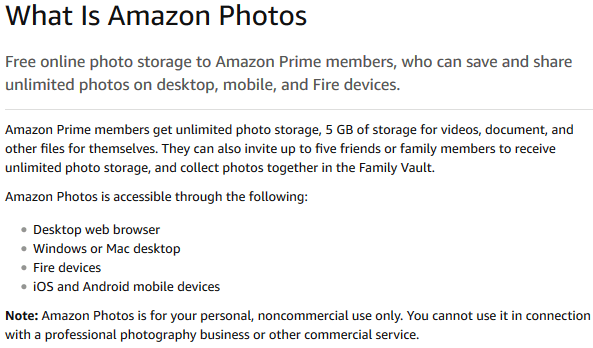 This is the solution to use when you want to grant Named User photo library access to your friends and relatives. It is possible to configure Photo Station to allow each individual to have their own Photo Station Library. 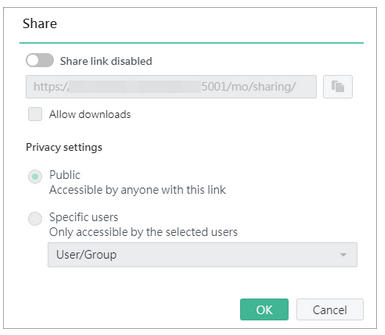 If you want to have a single library, shared with everyone, then do not select this option. That is my setting, and what I have assumed in all of these posts. If you want users to have a private area where they can, for example, backup the photos on their smartphones to a private area then you should select this option. However, combining those images into a central library will become a task on its own. This guide does not address that need. This one is very important as it will directly affect external access. You need to provide one crucial parameter here. If you don’t know what goes here you can look it up elsewhere in DSM. If you have a static IP address for your router that’s great. Most people don’t, and their IP address will change every time they reboot their router. Some ISP’s will not issue static IPs to residential lines – BT in the UK is one example. Hostname is the solution. 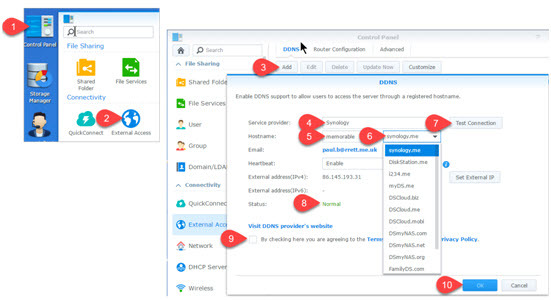 To find your hostname go to Control Panel > External Access and look at the DDNS tab. You may need to resize the Hostname column to see the complete name. Enter that name into the Hostname or static IP field. Login to DSM as admin and select Control Panel. From the drop down selector choose a service provider for your DNS service. For the purposes of this illustration I have chosen Synology. Choose a meaningful and memorable name for your NAS. It will also need to be unique and we’ll test for that later. Choose a service suffix that best describes your needs. Test the connection to check that your selected name and suffix are unique. When the test succeeds this status will change to Normal. Accept the Ts & Cs. Most of these settings are reasonably self-explanatory but there a few that may more explanation. The light box is the right hand panel (in the web UI) that contains a LOT of the metadata for an image. You might not want such detailed information to be available to all guest users. Photo Station does not handle image orientation metadata very well. Images that display with the correct orientation in multiple other applications (including Daminion) will display incorrectly in Photo Station. If you check this option, and then change images to what appears to be the correct orientation, Photo Station will write ‘corrected’ orientation details to the files’ metadata. This will cause the images to display incorrectly in other applications such as Daminion. Correct the images again in Daminion and they will become ‘incorrect’ in Photo Station again. In the interests of your sanity, I strongly recommend you do NOT turn this option on. The enable tree view option is only relevant in the web UI, not in the DS Photo apps (for PC, Android, iOS). Since the person most likely to use that UI is you, the admin, then you will probably benefit from having it enabled. It’s a personal choice however. Pagination is another option that’s only relevant in the web UI, used mainly by the admin. I have a large screen so I set this value to the maximum setting to avoid having to use the previous / next page controls. Again, it’s a personal choice. GPS is sensitive information that will reveal the location of you or your family members. Photo Station's face recognition function is experimental and until Synology improve it, it is inaccurate and a resource hog. Feel free to play with it but if you turn it off again, you must remember to reboot your DS to kill the background service. Indexing and thumbnail generation is a resource hog. There are some settings in Control Panel > Indexing Service that you can tweak to optimise the process. Now is the time to re-enable the file indexing service that we disabled earlier. Add the \photo folder back in. When you are done go back up and press the Re-index button to get things started. Indexing will take time. You have to be patient! If you set the thumbnail quality to HIGH you will significantly increase the conversion process. Normal Quality thumbnails will display with no problem on any screen size (tested up to 27 in [69cm]). Only enable this option if you routinely watch video served up by Photo Station or DS Photo. Note: The following options are available by default to all named users and cannot be turned off. But they can seriously damage your photo library. You will need to coach your named users carefully to NOT use these options, or only allow guest access to those you cannot rely on not to use them. I have a folder of selected photos that I don't wish to share so they are marked as Private (3). To make the whole library inaccessible, do the same for the rest of your folders under /photo. Before we think about what Named users can see and do we should understand what minimum rights Guest Users get by default when a set of folders is made public. Who knows, maybe 'Guest is best' and you don't need to do anything more? What can a Guest See? 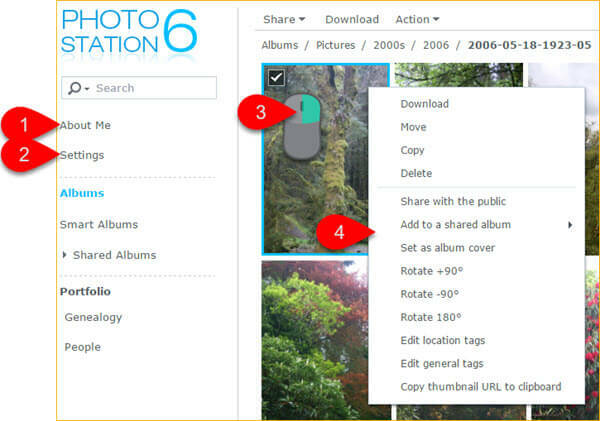 Photo Station Albums are your photo folders (that is, the ones you have marked as Public.) So immediately we see that by drilling down through the albums a Guest user can see any image in the public folders. 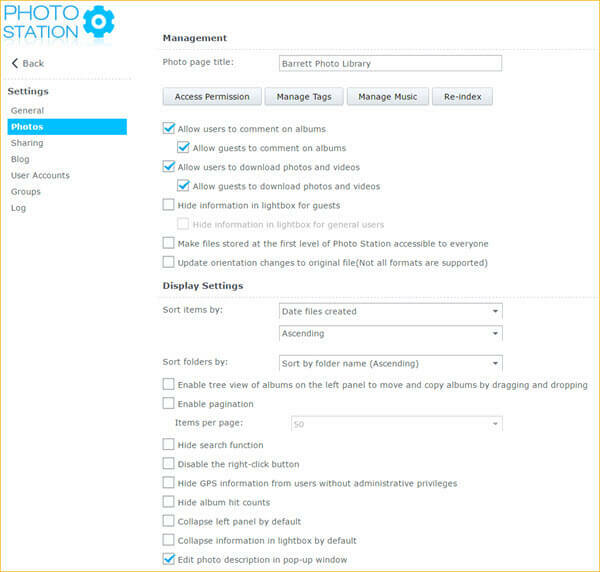 Smart Albums are maintained by Photo Station and contain three categories, Location, People and General. We've spoken about these before but to recap, Location and People are of limited interest to Daminion users. General contains all the Daminion keywords. There is no limit on which keywords a Guest user can see so, just like Albums, they can see all your public photos, but through a different lens. The Portfolio Categories you want to make public. The items you choose to put in each category. Photo Station refers to Guest Users as Guests and Named Users as Users. I will call them Named Users and Guest Users because they are both a type of user. 3 to 6 allow us to control who can share content with the public. All users might be too much and Administrator only would be too restrictive. There's really not a lot to say about this page because everything is unremarkable. The About Me label is confusing. It's not about the Named User at all, it's about the person who set up the system! A better label would be About Owner. I mentioned these in the previous section. They are appropriate to an Owner or Admin but I don't want a Named User messing with my library under any circumstances. Using an editor to change the images raises similar concerns. I can see how it might be helpful to have some named users to have the ability to edit. The title of this pop up menu confirms that the need for an editor role. But it's a limited role, not one I want to grant to all named users. No matter how I set this option, the entry screen remains the same for me. This table provides a summary of the metadata recommendations, for those that just can't wait. Photo Station Face Recognition Face Recognition is experimental. It is also a resource hog. Any other category you want to appear in Photo Station Create a Daminion Keyword Group for each category you want Each Keyword Group will appear in Photo Station's Smart Album > General Tag. How does Daminion treat the metadata in the new catalog? 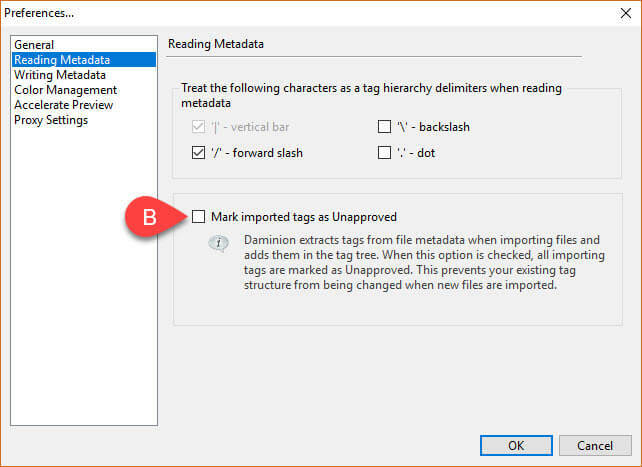 As Daminion adds files to the catalog it will read the files' metadata and import any tags that it discovers, recreating any nested structured that was present. If, on the other hand, your tagging was carried out in an app that only supported flat tags that is supported too. Whatever format they are in, Daminion makes it easy to reorganise them, with a simple drag and drop capability in the tags panel. People is a dedicated tag type which may be structured into groups e.g. Family, Friends, Acquaintances, Customers and Suppliers, for example. You can apply multiple People tags to a group of photos to speed up the tagging process. Daminion writes the tags to specific fields in the image metadata but these are different to the fields used by Photo Station which means that the Daminion fields is of no use to us. People uses dedicated (but different) metadata fields that can only be applied by viewing each image, lassoing each person and entering their name. This is a laborious and time consuming technique. Once a name has been entered, type down will present you with a list of previously entered names to choose from. There is no formal way of grouping people by Friends, Family etc, and there is no way of applying a name to a group of photos. For these reasons the use of Photo Station's People Tag is not recommended. It’s inaccurate. In my tests across thousands of photos it identified zero people correctly. It misidentified people repeatedly and did not appear to get any better as it was taught who was who. For every face it found it would find many more ‘faces’ in the background that were just parts of the scenery. It’s a resource hog, regularly maxing out CPU and RAM. This is significant for hobbyist photographers with low end DiskStations. Try it out, but when you disable it, remember that you will need to reboot your DiskStation to kill the resource-hungry background process. Synology's approach to Locations (Places in Daminion speak) is to geotag an image or group of images. You enter a search term, accept the closest result for the location you searched for and have no immediate control on the label that gets applied - what the mapping tool returns is what you get. There is no way of finely adjusting the geotag to a precise location in Photo Station. The location label is not written to the image file - it is stored on Photo Station's internal database - so there is no location label information to share with Daminion. The GPS coordinates are written to the image file, in a set of fields that are are also used by Daminion. However you can geotag in Daminion too, much more easily, and with greater precision. Once again we have a field incompatibility issue between Daminion and Photo Station; and once again the solution is keywords (see next section.) . 14 screens on a 27 inch monitor. 34 screens on an iPad. 68 screens on a smartphone. This also means that page load times on all devices are slower than they would be if there was an expanding tree. For example, with a Gigabit wired connection to my Synology DS216j, it took 12 seconds to render the General tags page. That has reduced to 6 seconds on my DS916+. Nothing is cached either so if you flip between screens it’s a repetitive 6/12 second wait. It's easy to overlook the power of search. Having indexed the image files, Photo Station's search capability is fantastic, and will return search results in a few seconds. This is a fraction of the time it will take to render the General Tags page and begin to scroll through looking for the precise keyword you want. The power of search fully justifies all that effort you put in to keyword tagging your library, because all that data is embedded in the image files and is instantly searchable. When you are tagging in Daminion there are two key counters you should aim to get to zero. No image should be unsynced or it will not appear in Photo Station. Right click an entry in the People Keyword Tag and choose Edit Synonyms and you can enter alternate names. Now, when you are tagging in the Daminion Properties panel you can enter any of his names and apply the correct tag. Just in case you missed it before, this table summarises which functions you should perform In Daminion, and which in Photo Station and, perhaps more importantly, which functions you should ignore in each of the applications. If you are going to import a large batch of images it's a good idea to temporarily prevent Photo Station from indexing the new images before you have had a chance to tag them. For small batches on powerful DiskStations the overhead of the same images being re-indexed as you import them, and again when you tag them will not be an issue. There will be a tipping point at which the re-indexation becomes an obstacle. This will vary depending on the power of your DiskStation, the speed of your network and your personal tolerance level. It's good practice to do file imports using a hardwired connection if possible. It's significantly faster than WiFi. If you can't tether, then make sure your laptop is a close to the router / access point as possible to get the best speed with least drop out. If the images are located on a camera or removable drive use the Daminion > Add Files option to import them to the library. Refer to standard Daminion Help for details on how to do this. If the images originate from physical media (prints, negatives, slides) you may want to adopt a different approach. Because all scans need some post scan editing work I prefer to do that locally, before I import the image to Daminion. This not only saves unnecessary re-indexing and thumbnail conversion in Photo Station, it also avoids the need to recreate thumbnails in Daminion. Scan to a local folder on your hard drive. Use a photo editor to crop, rotate and adjust image characteristics. Upload to a 'Scans' folder in Daminion Catalog. Rescan folder to import image(s) to library. Edit Creation Datetime in Daminion Properties Panel. Move the images to a date stamped folder. Highlight last imported scans by using Saved Searches > Last Imported in preparation for tagging them. Apply appropriate keyword tags (there should be at least one keyword tag for each image - 'Place'). Don't. Tagging is complicated enough between Daminion and Photo Station without throwing in a joker card. In a previous section we looked at the various tag categories available in Photo Station and Daminion and concluded that we could support Photo Station best by concentrating our attention on a group of Daminion Keywords for People, Places, Events, etc, since these were the only tags that were read by Photo Station. Daminion Keyword Tags translate to Photo Station General Tags. 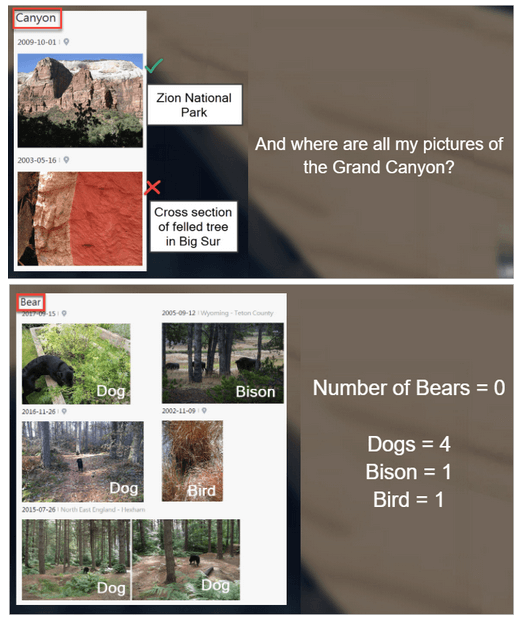 Can you manage the General Tags in Photo Station? And if you do, what is the impact on Daminion's Catalog? Your spelling / syntax has to be precise or you will create a new and unwanted keyword structure in Daminion. 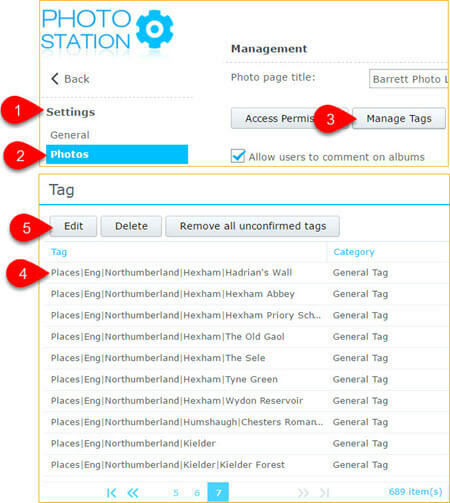 Fortunately, Daminion has a clever trick up its sleeve - you can set an option that any new tags it detects are marked as "unapproved" allowing you to validate, approve or merge them to others, which will then update Photo Station and cure the problem in both apps! You can add existing keywords to an image through the picture view but there is no partial match search. This means you have to type down, or scroll through the list to find the one you want. You can group edit images' keywords but there is no ability to pick and drop tags from one photo to another or to a group. So it may be technically possible but it is not a workable solution. Even if you are prepared to deal with all the issues listed above, nothing you add or edit in Photo Station will be visible in Daminion until you manually Read tags from file or Rescan Folders in Daminion. Making sure you select the correct scope of images to read is time consuming and error prone and you might have to scan a parent directory or even the root directory in Daminion, which is also time consuming. You can overcome this by using the Home Server version (see later section) but in the standalone version, editing metadata should be carried out in Daminion, to save a lot of effort. In contrast to Photo Station, Daminion has sophisticated methods for managing and applying hierarchical keyword structures. 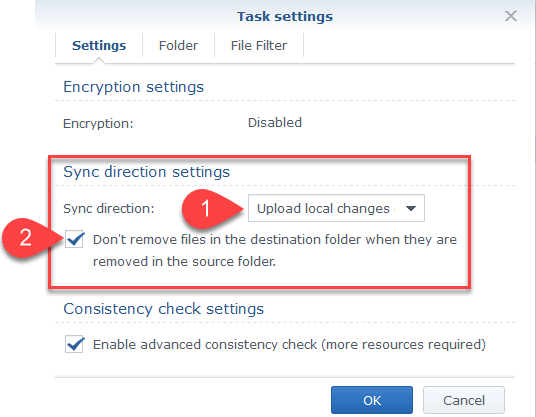 A simple addition, edit or deletion of a keyword will, through auto-sync, lead to the automatic update of all related images and because the library is stored on a Synology Disk Station the updated files will be recognised and re-indexed automatically. Apart from the need to limit yourself to keyword tags only, there are no other special requirements for tagging in Daminion to support Photo Station so the best place to look for instructions is the Daminion Online Documentation. GPS is standard on all smartphones / tablets and is appearing on dedicated cameras too. It's obviously the way forward and it allows us to use a map view of locations to visualise and access our photos in a new, graphical and intuitive way. If you are not into geotagging, move right on. You can geotag in both applications but there is only one workable combination of Daminion and Photo Station functionality which is to manage and if necessary apply the tags in Daminion and view the results in Photo Station. 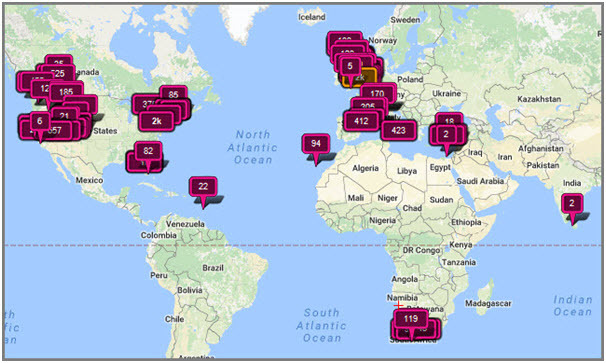 It's best to geotag images before you keyword tag them because the number of geolocations will help you decide how many 'Places' keyword tags you need to create, or whether to associate closely located geotags under one keyword tag. Daminion has a great map view which shows numbered markers to indicate the number of images at that location. You can zoom in to see more granularity and right click to display the items at a location. How does Photo Station's map view compare? Well it's no surprise that it looks very similar. It lacks the 'number of photos' indicator that Daminion's has but that's all.. Unfortunately there's an issue - the Photo Station Map is a hidden feature, only accessible in the Album views. If you are in any of the Smart Albums you cannot access a map view. Geotagging is of course separate from geotagging. As described in an earlier section, images need to be tagged with a places keyword so that they can be searched or browsed by name. 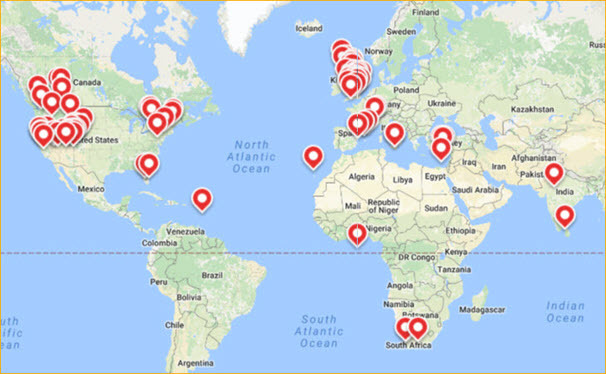 You can exploit Daminion's map view to help with the tagging process because if you do a map search for a place, then all geotagged images at or near that location will be shown on the map. This makes it easy to select groups of images for keyword tagging. You can also choose to merge nearby locations when the camera's GPS accuracy creates a confusing cluster of nearby locations. Synology's new photo management app "Moments" uses a different approach to geotagging and labelling. It derives the address label automatically from the GPS data. But it's not very good a deriving meaningful location names. For example none of my pictures of Yellowstone National Park feature the words "Yellowstone," "National" or "Park." My home address includes a reference to "Riverside House." My house is nowhere near the river, and there's no where called "Riverside House" in my town. It will get better as the AI tools are refined. As I mentioned earlier there's a paricular situation where you might need to adjust a geolocation - from the location where the photo was taken to the subject’s location. This is important when you are taking photos of subjects from a distance – you may be miles away when you take a photo of a mountain. A counter argument is that you should use the camera location so that you can return to the same place to retake the photo. Others say that there may be several subjects. And if you take a photo of the moon, what is its geolocation? Whether to geolocate by camera or by subject depending on the image content. To decide what the main subject is. We will have to see how / if Daminion and Synology implement the new geotags. For now the answer is to geotag manually using your own definition of locations. Some GPS data can remain visible in Photo Station even when Photo Station is configured to suppress it. This is not a Synology issue. The problem is that there are many fields to which GPS data can be written by other apps. Synology suppresses their own chosen fields but the fields added by other apps remain and are displayed by Photo Station. 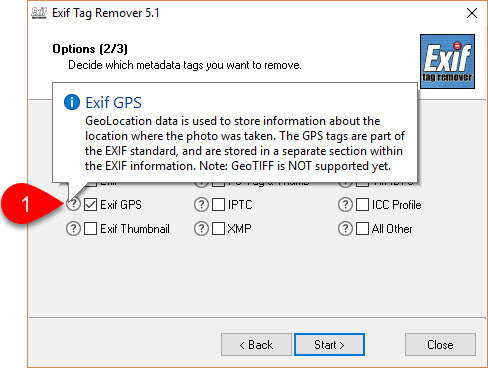 This section describes how to remove all the GPS data. Depending on the number of images selected and its processing power, it may take a while for your Disk Station to reindex and convert the files. The latitude and longitude have been removed. There are several artifact fields remaining but they don't identify a location so could be left in place. Combined with the Photo Station setting to suppress its own GPS coordinates, this may give you a workable solution. If you want to remove the artifacts, read on. 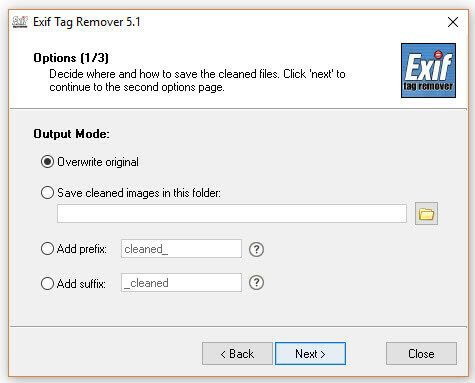 We looked at Exif Tag Remover in an earlier section so we won't go the basics again. OK, so that looks very good. What could possibly go wrong? 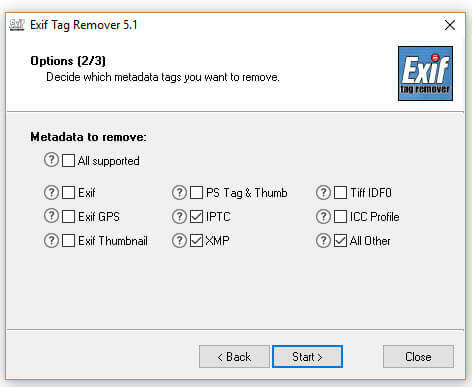 Exif Tag Remover deletes the GPS data directly from the image file's metadata. But some of that deleted data still exists in Daminion's Catalog. 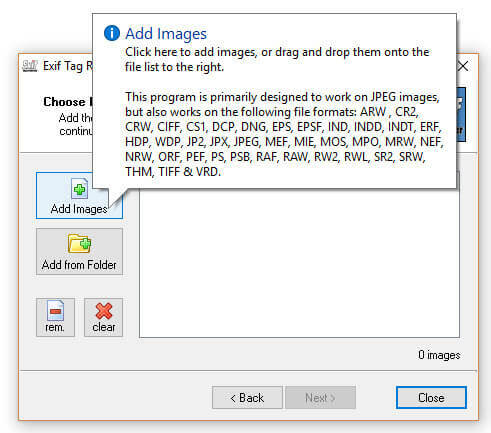 To synchronise catalog and files you have to carry out a vital task - select the same scope of image files in Daminion and then, read the tags from file. Be careful in your command selection. 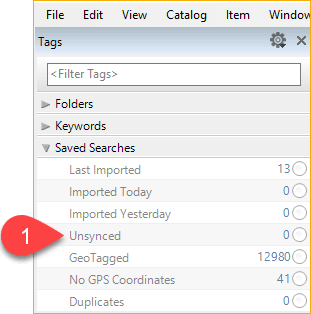 If you choose the write tags to file option by mistake, you will rewrite the GPS data to the file(s) and you'll have to start over! It's not a fatal error but it is a chore. After the relative simplicity of Exif Tag Remover we come to the more daunting prospect of using ExifTool to do the same thing. I dealt with ExifTool in detail in an earlier post so I will go straight to the required commands. 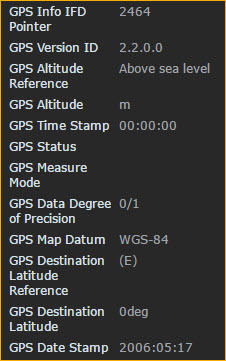 This command will also have dealt with any GPS data in the Composite section of the metadata because that is derived from other parts of the metadata, it is not written directly. Thanks to StarGeek and Hayob Ban from the ExifTool Forum for help with those commands. Where should you add, move, delete and rename folders and images when it is possible to do this in at least three places, Windows Explorer, Daminion and Synology File Station? Always do these changes in Daminion. It's not that Daminion can't handle it if you do these operations elsewhere but (at least in the standalone version of Daminion) the process to get the folders and contents in back in sync has to be invoked manually, and if you have renamed any images it will result in some clean-up work. Re-scanning the folders from inside Daminion will pick up any changes made in File Station or Windows Explorer but depending on the size of your library and how high up the folder tree you invoke the re-scan, it can be a very time consuming process. However, re-scanning can easily be avoided if you do all folder and image work in Daminion. This includes uploading files from a digital camera – the Daminion import routine is as good as it gets. Note: An occasional RE-SCAN is no bad thing. Periodically it is a good idea to vary out a complete housekeeping re-scan of your folders in Daminion. Consider it good housekeeping. It will remove any deleted images from the catalog and pick up any strays that have found their way into the folders but not into the catalog. But remember that scanning a large NAS based library will take time. Be patient, and remember to turn off sleep mode on your PC while the process is running. File and folder management is easy and intuitive in Daminion. You need to overcome your instinct to make file and folder changes in Windows Explorer or Synology File Station. Those two operating systems will be fine with whatever changes you make in Daminion, but they can't update Daminion's catalog. For that you need Daminion's Home Server version, which has a folder watch service to pick up changes on the Disk Station. If the user is only going to use Photo Station do NOT accept the defaults. Change the settings to Deny all applications. Note: DSM will still create Home folders when it creates the account. They will remain empty because they can't be accessed by the user. If you want to keep your Homes folder tidy you could delete them in File Station - it won't affect the user's account. However, if you have any reason to believe that you may want to offer other DSM based access to the user later, then you should preserve the home folder because it maybe required to support those services. For example: Synology Drive and Moments. You need a backup strategy. You have invested a lot of time and effort in taking, storing and cataloguing your photo library and you don't want to lose it. A 3-2-1 backup strategy is good practice. How secure is your primary version? If you have a one-bay DiskStation you should seriously consider upgrading to a multi-bay enclosure and use RAID or Synology's SHR. RAID is not a backup solution, it is a service continuity solution. In a one-bay system if the disk goes bad, you may lose everything and will need to purchase a new disk, reinstall DSM and restore your content. In a multi-bay system set to mirror the disks, if you lose one disk the system will continue to work while you source and replace the bad disk. All current DiskStations have a minimum of 1 x USB3 port, so backing up to one (or a rotated set of several) USB HDD is a basic but cost-effective backup strategy. But storing the disks close to or somewhere on-site is a risk. Fire, flood or theft will probably take out your local backup as well as the primary. The problem with backing up to USB HDD is that if the backup disk goes bad you will lose your backup. The solution to that is to use a low end two-bay DiskStation as a backup target. I use an otherwise redundant DS216j for this purpose. That secures the data from HDD loss, but also allows Hyper Backup to maintain a rolling sequence of backups sets. However it's still on-site, which is a risk. The final strand in a 3-2-1 backup strategy is to have a remote backup set. If you are fortunate enough to have a second spare DiskStation and you have a willing, trusted friend or relative, perhaps you could place the unit at their house, and have a reciprocal arrangement? Or maybe you have an office in your garden? My preferred remote backup is a cloud solution. 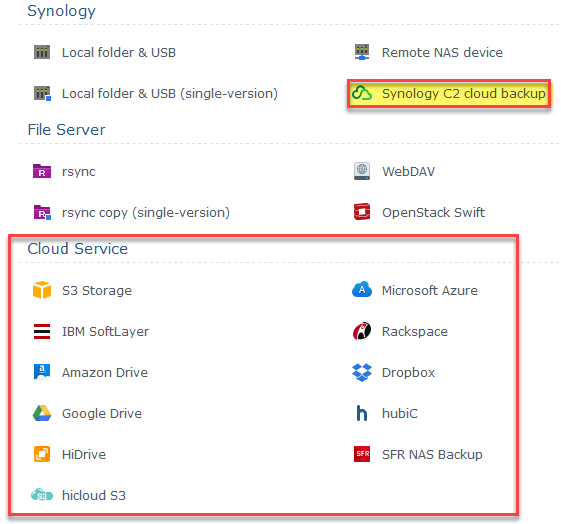 Synology supports range of cloud services but my preference is to use the Synology C2 cloud backup, simply because it's easy to set up, uses the same Hyper Backup application to manage the backup sets that is used to manage the local ones, and uses some neat technology to reduce the size of backup sets. This provides you with yet another off-site backup for you content and if you adjust the settings to uni-directional (1 below) with preservation of the online copy when the local is deleted (2), you have another place where you can protect yourself from accidental erasure of content. Now that you have installed Photo Station, your Disk Station is public which means it is a candidate for attack. DSM is very secure but even if you decide not to upgrade to the latest Daminion release, you should ensure that DSM and Photo Station are kept up to date so that you have the latest security patches in place. Unless you are running the home server version of Daminion there is a risk of the folders in the Daminion Catalog becoming out of sync with Photo Station. Although the recommendation is to do all file and folder management in Daminion, it's easy to forget and add, delete, rename or move a file of folder in Photo Station, File Station or Windows. A periodic rescan of folders, from the root of the /photos folder will pick up these changes. Unsynced items are those where the metadata may not have been written to the image files and which will therefore not display correctly in Photo Station. This count should be zero. Every image should have a least one tag or it it will not be discoverable in keyword guided selections, or by searching in Photo Station or Daminion. Ideally this count should be zero, or you should know the reason why an image is not yet tagged. This section looks at the Creation Dates minefield. Yes, that was a plural, Creation Dates. You'd think that one Creation date would be sufficient wouldn't you? After all there can only be one date on which an image was originated. 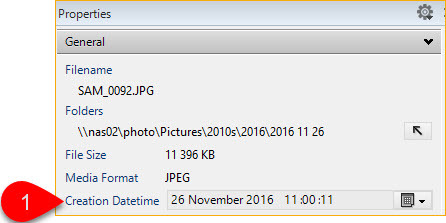 However there's an important distinction between the Date and Time a picture was taken on the camera, and the Date and Time it first makes its appearance in the computer's file system. People who want to organise their image folders in date sequence. Photo Management and publishing apps that have options to sort images by date. It is obviously wrong to have a photo from the 1940's appearing in a 21 century timeline, but that's exactly what happens in most applications. 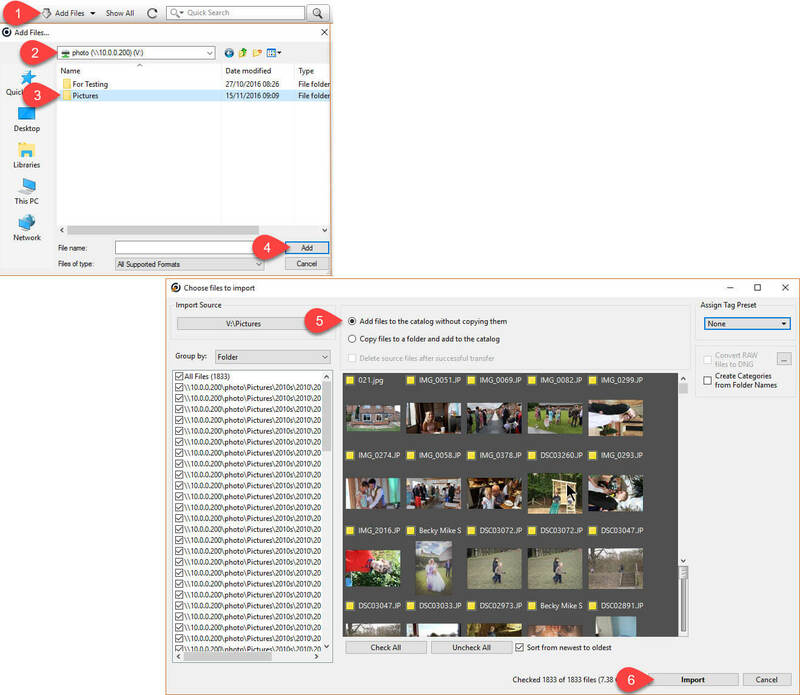 This a view of a picture's metadata viewed through Windows File Explorer directly after capture, before the image has been moved or processed anywhere. Date Created which is created by Windows as soon as the image is brought into the file system. We need to dig a little deeper, into the metadata that is stored within the image file, which stays hidden for most of the time to most users but which, among other things, affects the sort order in apps. When it comes to image metadata there is a lot of it. At the start of a file's life there is a mass of information related to when the image was taken, its format, details of the camera, the lens, the camera settings, GPS information (if your camera is GPS enabled) and some very obscure items. As the image is imported, edited and tagged it acquires more metadata from every app that touches it. There does not appear to be a definitive list of all the metadata fields. Daminion even allows us to create custom metadata fields of our own. There are three different date fields. 1 is from the File System for the date the file first appears in Windows (in this case about 100 minutes after the picture was taken). 2 and 3 are identical and are the date / time the picture was taken. 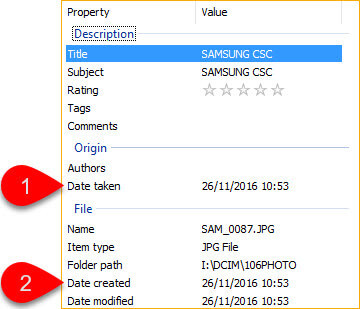 In this case the File Creation Date/Time field is when the photo was scanned into the Windows file system. Obviously there is no Date Taken but even though I have added a keyword to the image in Daminion, the two fields in the IPTC section have not appeared. Instead we have a new date, in the XMP section with a slightly different date format in which the time offset is given as Z (Zulu time). Don't edit this date unless you are sure that all your photos are from the digital age. This date is used by computer file systems. Therefore if you edit it to a date that pre-dates computers you will encounter problems. Under some circumstances you will find your apps choke on a file system date that predates them, and produce unpredictable results. How do Photo Apps Sort Photos? The result is often chaos, with images appearing in no useful order at all, regardless of how you try to sort them. Sometimes the simple solutions are best and if all your photos are sourced from one camera then sorting by filename is an obvious solution. Of course if you have multiple cameras and some scanned images then that's no solution. You could rename the files to force them into your required order but unless you rename your entire collection using a numbering system that carries across all folders that approach will not work. This will update the Date/Time Original field in the metadata. The trouble is that that Synology Photo Station doesn't use that field . However, even with that limitation, the ability to edit that date is incredibly useful because it allows you to have one highly visible date that you can use as part of a workflow to get images into date-stamped folders. A preference setting that allowed you to specify which date fields to align with the Creation Datetime. A new form of Tag Preset which allowed you to do the same. But Daminion does not have that feature so we need another solution. The solution is an app called ExifTool by Phil Harvey. 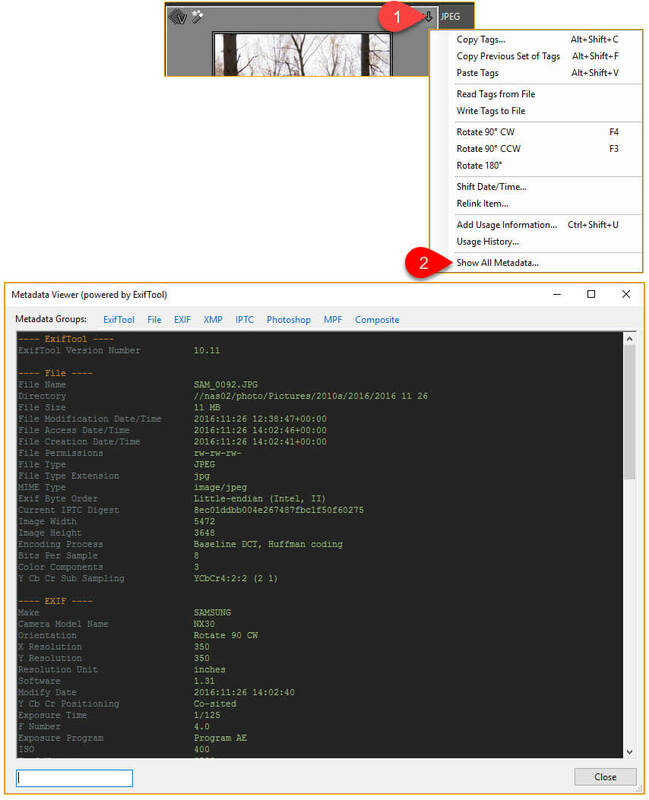 This is a really powerful app for editing metadata and comes in two forms; a command line interface (CLI) that you invoke at the DOS command prompt, or in a GUI wrapper for those people who are not comfortable with the CLI. Daminion has an option to call ExifTool using a GUI but to be honest, I find the CLI easier to use. The rest of this section assumes that you are familiar with the mysteries of the DOS command prompt. Step 1: Download the ExifTool and unzip it into a dedicated folder. There's no Windows installation process and nothing gets written to the registry. 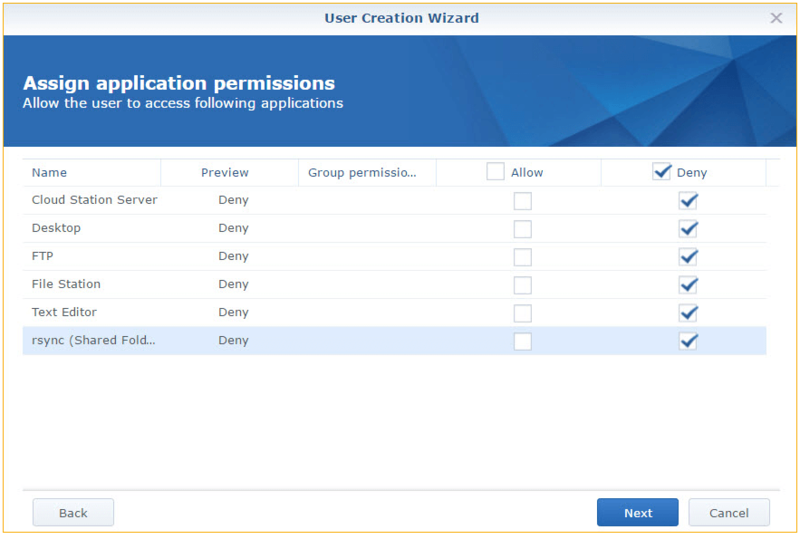 Right click and choose the Run as administrator option to avoid potential permissions issues. Step 3: You will find yourself at the DOS command prompt. The remaining steps are easier if you move to the directory where you installed ExifTool. In my case c:\windows\exiftool. You MUST copy some images to a test location and test the commands there before you run them against your live library. You MUST backup your live library before running commands against it. These are simple and sensible precautions - your insurance policy if things go wrong. If you don't follow these two precautions please don't blame me for any damage you do to your library. In fact, don't blame me for whatever happens. I offer this advice on a no liability basis. It's up to you to verify you're happy with the commands before you proceed. If you have the slightest doubt, stop and rethink. There is a wealth of documentation about ExifTool although much of it is aimed at 'techie' users. For the rest of us the User Forum is incredibly helpful, responsive and very tolerant of newbies asking "dumb" questions. They even have a dedicated thread for newbies. Here are some example commands that I have used to manipulate metadata dates. I will explain the syntax as we go. I would advise you to read this through to the end before starting as there are some useful tips along the way. You can scroll through the data, jump to a specific section using the Metadata Groups at the top, or search for e.g. 'date' using the unlabelled search box at the bottom left to identify all the date fields in the file's metadata. All fields use a Display Name for clarity but when you update one of those fields in ExifTool you will need to know the real field name. Fortunately for the fields we are using the field names are easy to identify because they are simply the Display Name with all spaces and '/' characters removed. For example, File Creation Date/Time becomes FileCreationDateTime. If you have already updated the Daminion Properties Panel field Creation Datetime on your image then we are able to use the EXIF Date/Time Original field as the definitive source for our ExifTool commands, because that's where Daminion wrote the amended data. You can annotate the commands to remind yourself what they are for and what the switches do. This is the path to the folder where the images to be updated are located. You can use drive letters if you want but I prefer UNC paths. If you add a specific file name then the command will be limited to just that file. You'll note that this parameter, like the preceding one, is enclosed in double quotes. This would be essential if the path or filename contained any spaces or $ signs which would cause the command to abort (or worse). Whether or not there are spaces I always use the double quotes, because I find it helps make the sections of the command more visible. The -r switch tells ExifTool to also process any sub-folders beneath the specified folder. Omit it if you only want to process the specified folder. The -m switch tells ExifTool not to report minor errors it finds in the metadata. It will correct them but not report the fact, which speeds up processing and eliminates excessive screen scrolling. Windows is often the culprit for minor inconsistencies and ExifTool is wise to its devious ways. The -P switch (note the uppercase 'P') instructs ExifTool to preserve the existing File Modified Date instead of updating it to 'today.' This is a question of personal choice but in my view when the metadata is updated but the actual image remains the same then the file has not been materially modified and the File Modified date should not be changed. Feel free to disagree. But if you do, just remember that some photo display apps sort by File Modified date only. Update your whole library on the same day and you will have one giant sort result. If the -overwite_original switch is omitted then for every image that the command processes, a backup file will be created in the same folder. That may seem a good idea but remember that if you execute this command from the root folder of your library, then every file will be duplicated. It wastes disc space and slows down processing. If you followed the advice above and backed up your library before proceeding then you have no need for an extra backup copy and should include this switch. At first glance these two fields look more complicated because they each need only part of the Date/Time Original field. The good news is that ExifTool will extract the relevant part for each field so all we need to do is modify the commands we have used in the previous sections. Composite Date/Time created is not a writeable field but is inferred from the other dates we have edited. So there's nothing to do here. As you complete each command you may want to check on your progress by examining the metadata. 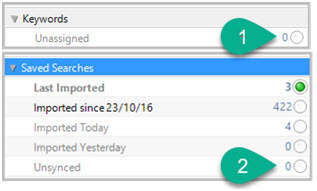 The easiest way to do that is to use the Actions > View All Metadata option in Daminion. Previously we have run individual commands and, initially, that is useful if you want to check that a command has performed as expected. However, to make continued passes over the image library is inefficient because of the repeated disc Inputs/Outputs. When you have moved beyond testing to 'production' operation it can also lead to inconsistencies in your image metadata if you forget to run one of the commands. Replace this section with your path to the ExifTool app. Replace this with your path to the folder(s) you want to process. It's important that each tag command is enclosed in quotation marks. As I started implementing Daminion and Synology Photo Station I found I was constantly adjusting metadata to get the results I wanted. Sometimes it is necessary remove some or all of the tags and start over. At this stage I had not discovered ExifTool by Phil Harvey which is more than capable of removing tags. 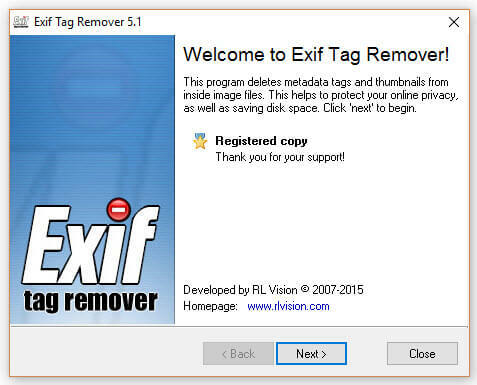 But I had discovered a neat tool, dedicated to tag removal, called Exif Tag Remover. Although I am now an ExifTool fan I continue to use Exif Tag Remover because it so easy to use, with only six easily understood screens. Therefore, unlike ExifTool commands you don't have to spend time checking syntax and testing. I always select Overwrite original because I only ever do this on small groups of test images. 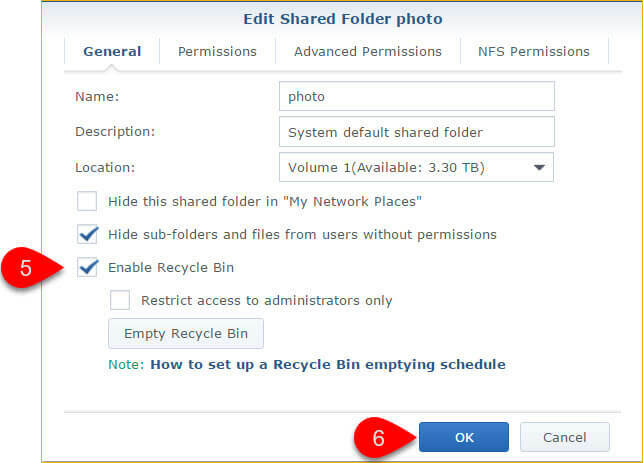 On a Synology Disk Station be aware that if you select the option to Save cleaned images in this folder you will need to place the folder outside the /photos folder and in a location that is not indexed by Synology, otherwise DSM will index the new files and create thumbnails, which will take forever. Even if you select the Overwrite originals option, the replacement files will still be seen as new by Synology and they will be re-indexed and converted. 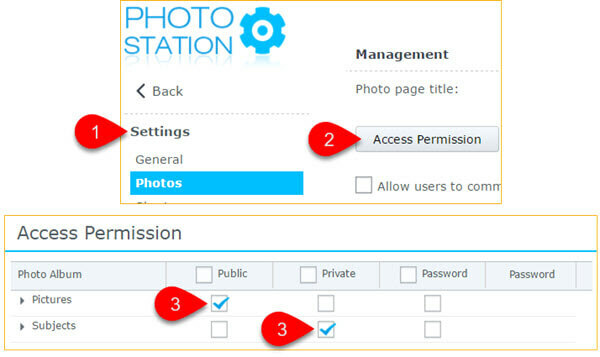 When you accept the revised files, or if you Overwrite originals Photo Station will see the files as new, and will not connect them to the information stored in its database for the original file, such as Photo Station's native People and Location Tags (if you use them). You'll have to retag them. Not good. 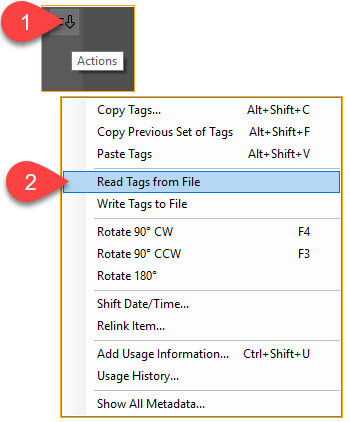 In Daminion you need to be very careful with the Actions > Read Tags from file and Write Tags to File options. 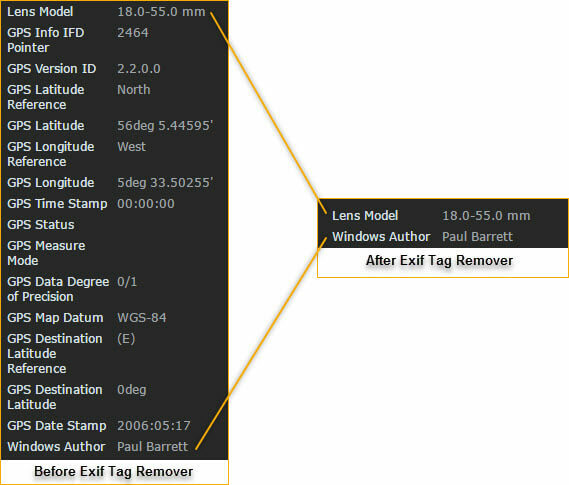 If you read tags from files in Daminion after clearing the tags in Exif Tag Remover you will lose the tag links in Daminion. That may be what you want, or it may be a colossal disaster. Similarly, if you delete tags from the files in Exif Tag Remover and then write tags to file in Daminion you will replace everything you just deleted and kick off another Synology indexing / conversion session in the process. Deleting tags across an entire live library is bad practice and should be avoided wherever possible. 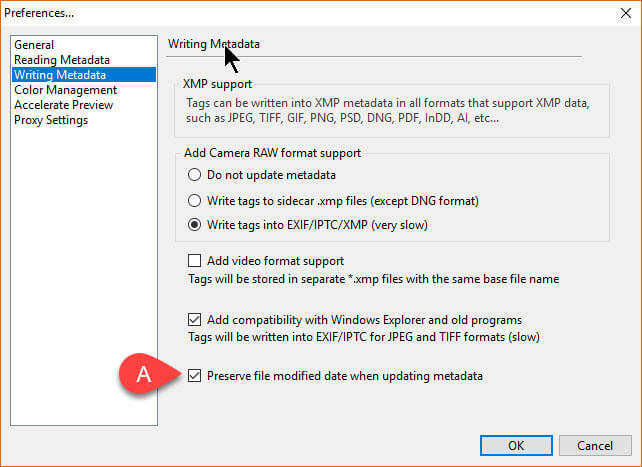 For most Daminion and Photo Station purposes the Exif, IPTC and XMP sections are the most likely candidates for removal because they contain, for example, the keyword tags. Exif GPS is useful when you are experimenting with GPS data (obviously). As for the All supported tags option I have never done that across an entire library and, for hobbyist users, cannot think of a valid use case to do so. All I can say about screen 6 is, for hobbyist users, move on. Clearly, if you are experimenting with deleting tags you should do it on a limited subset of images or on a set of test copies. You are only removing metadata from the image file. It is still contained in the Daminion Catalogue so, if disaster strikes, you can always re-write the tags from Daminion using the Actions > Write Tags To File option. If you delete tags and then update them in Photo Station you won't see the revised tags in Daminion until you use the Action > Read Tags From File option. You can perform tag removal in ExifTool and you'll find syntax examples here. If you have experience of doing that send some feedback describing your experience and the syntax, and I'll update this post. Daminion and Photo Station sometimes display images with incorrect orientation. The problem seems to mostly relate to scanned photos. The root cause may be the way the photo was oriented when placed in the scanner. After scanning an image into the library it may be incorrectly oriented. In Daminion this is usually related to the orientation of the photo in the scanner. You can get into a cycle where you correct the orientation in Daminion but it is still wrong in Photo Station. You correct it in Photo Station and it is then incorrect in Daminion. Rotating it to the correct orientation in Photo Station updates the image in Photo Station. But it is still not correct in Daminion even after you Read Tags From File. When an image is rotated in Daminion the app updates the file's metadata field EXIF:Orientation with the new orientation. Photo Station sees and reacts to the amended information. This will leave you with Case 2 - when an image is rotated in Photo Station the app does not write the amended orientation information to the file's metadata so there is nothing to trigger Daminion to update its orientation. The Photo Station orientation setting is only stored in its database. However, If we can't guarantee that the correct data will be written to the file I would rather nothing was written. There is a catch. Preventing Photo Station writing incorrect rotation data back to the file is great, and should prevent incorrect rotation appearing in Daminion. But if, for any reason, you decide to do a forced re-write of the metadata from Daminion, or if you edit any of the images in Daminion so that an auto re-write occurs, then Photo Station will misinterpret the rotation data again, and you will have to correct the orientation in Photo Station, again. Until Photo Station is updated to handle rotation information correctly, there is no other solution. 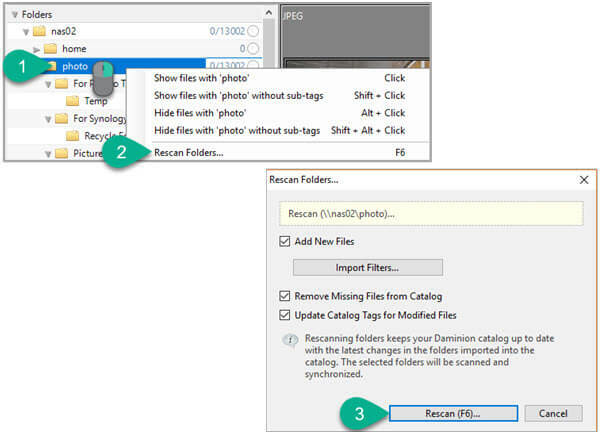 When you see a wrongly rotated image in Photo Station, the quickest way to find the matching entry in Daminion is to hover on the Photo Station image until the file name displays and then enter all or a key part of that into the Daminion search box. It's far quicker than navigating through folders. It works both ways. If you have an image in Daminion you want to compare with its matching entry in Photo Station, use Photo Station's search facility. 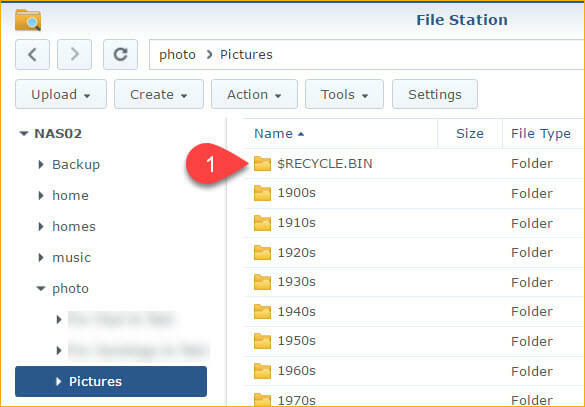 A few Synology users have reported the same niggling issue - the appearance of a folder called $RECYCLE.BIN in Photo Station. If you delete the folder it will reappear at some seemingly arbitrary point. 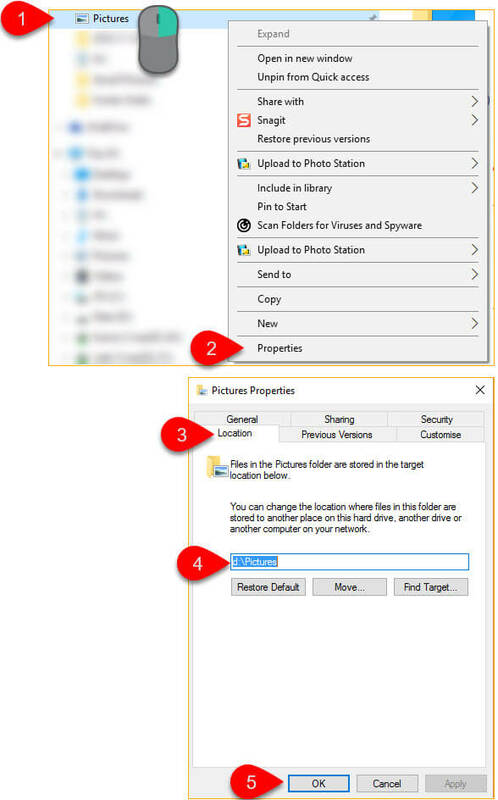 I had redirected my Windows Pictures folder to the \photo location on the NAS because it created a handy shortcut on my desktop PC but caused to the problem because of the way Windows handles recycle folders. I redirected my Pictures folder back to one of my local drives. Note: You will receive a prompt asking if you want to move the files to the new location. The answer is NO. A recycle bin is necessary for retrieving files deleted by mistake but, because Windows writes a network drive deletion to this Windows-style recycle bin we have to disable that function and enable a recycle bin in Synology. A Synology recycle bin won't show in Photo Station. Note: You can only set up a recycle bin in the root of a shared folder. Having set up a recycle bin to protect yourself from mistakes, you now need to think about limiting its use of disk space. 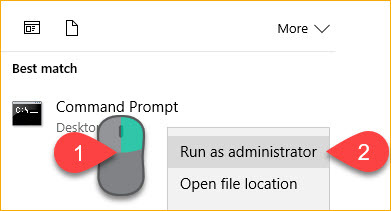 You can do this manually (see Empty Recycle Bin button in screenshot above) or you can set up a scheduled task to empty it periodically. To set up a scheduled task click on the How to set up a Recycle Bin emptying schedule link and follow the instructions given in DSM's Help System. In Nov 2017, Synology introduced a new package - Synology Drive - which is their take on the cloud/local sync concept offered by Google Drive and Microsoft One Drive (amongst others), using a Synology DiskStation for the "cloud" part of the solution. 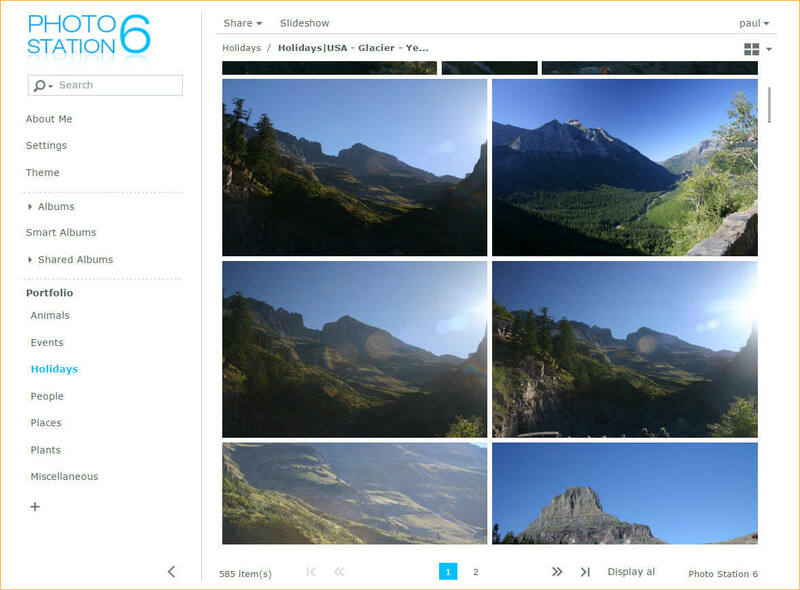 At the same time, the Moments package was released - Synology's latest generation photo management app. The implications of that app are covered in a separate article. This section explores the impact Synology Drive has on the Daminion / Synology integration. 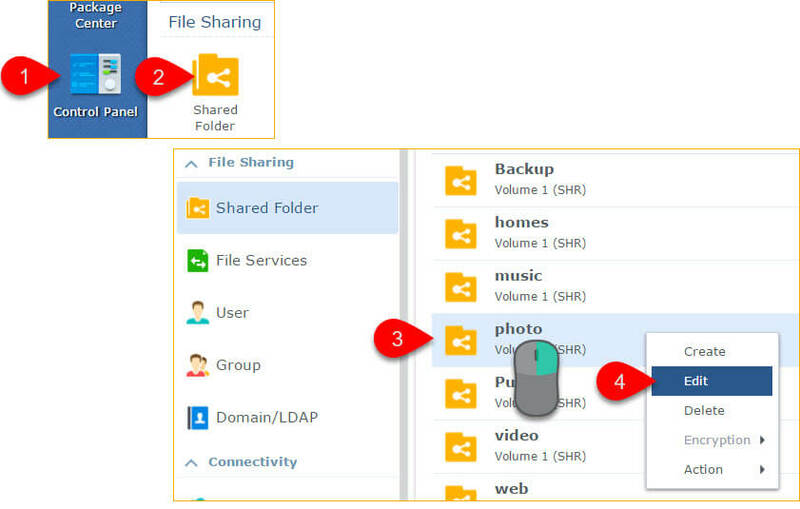 Drive enables a user to set up multiple synced folders between the Synology DiskStation (DS) and their computer. This can include a sync to the user's private Drive folder (which is located in the Homes folder on the DS) but additional sync tasks can be set up, for example, to the \photo folder which Photo Station uses. The folder to be synced has to be enabled in the Drive Admin Console. Sync tasks may be one or two way. Two way makes most sense with Daminion and Photo Station. Changes made to the local version of a Drive file will be synchronized in the background. You need sufficient disc space on your computer to accommodate the synced folders and files, which could be a problem for someone with a laptop that has limited SSD storage. For those users, linking to a mapped network drive remains the only viable option. Drive has server-side file versioning. You can set the number of versions of a file that you want to keep. It's an excellent function, but it's completely independent of and conceptually different to the Daminion Version Control function, so you need to be clear about which version of versioning you are referring to! Any DAM requires fast access to the source files. In theory, with all actions running from a local source, file access times should not be throttled by LAN performance. "Does Synology Drive respond as fast as an unsynced local HDD and better than a mapped drive?" As expected, the unsynced local HDD was fastest. Surprisingly, Synology Drive was significantly slower than the unsynced HDD when creating the catalog, although there was no appreciable difference when writing the tags to file. The mapped network drive performed worst of course, being 10.5% slower to create the catalog, and 23% slower to write the tags. Using a WiFi connection to connect a Daminion Catalog to a mapped drive would not usually be recommended, because of fluctuating WiFi performance issues and potential harmful effects on files if the network drops while a file is being written - the simple act of closing a laptop lid could cause that. The background sync of Synology Drive together with its auto resume solves that problem and makes WiFi connection viable, although a hardwired connection is preferable if large scale edits are performed. Do the majority of your library maintenance work in standalone Daminion, in the knowledge that this will automatically update Photo Station. If you make an edit in Photo Station, you will need to perform a refresh folders (F6) operation in Daminion to resync the Daminion Catalog. For many home users this is an adequate solution. Install Daminion Home Server so that Daminion can monitor the server folders for changes and update the Daminion Catalog. 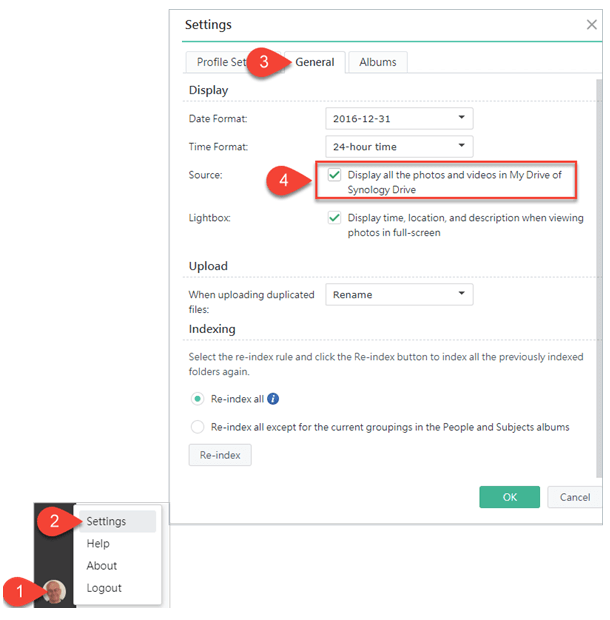 If you are making frequent changes to the \photo folders and files at server level, this is the option to choose. The Daminion Home Server is, of course, monitoring the server-side copies of the local files which, at the moment the Daminion folder watch service runs, may not have been synced by Drive. However, this should resolve itself given time for the processes to complete. Drive is an alternative way of moving content onto the server. Therefore any of the integration steps that deal with that topic are affected by this new product. The access point becomes a local synced drive instead of a mapped network share, which simplifies things for the user. But in all other respects the integration is unaffected. In Nov 2017, Synology introduced a new photo management package called Moments. This is part of an integrated suite of apps that include Drive, Calendar, MailPlus and Synology Office and is Synology's answer to Office 365 and Google apps. Synology say that the two products are complementary, with Photo Station aimed at serious photographers and Moments at casual users - people who want to organise their selfies, as one forum member suggested. Moments and Photo Station differ in one esential way. 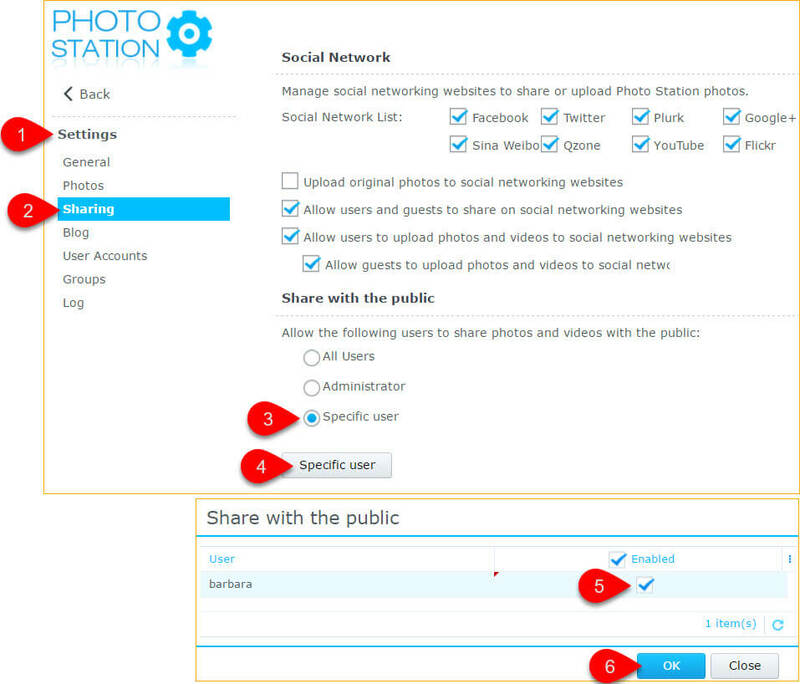 Photo Station uses a standard shared folder \photo that is public by default. Therefore Photo Station is publicly accessible too (although it can be locked down.) Moments takes the opposite view - each user has a Moments folder that is nested inside their personal Drive folder which means that the photos are private unless explicitly shared. If your intent is to share management of the library with other users or for your entire library to be publicly available on the web, this creates some challenges which will be dealt with later. Moments is much easier to set up than Photo Station which has so many configuration options that it can be a challenge to get it right. Because it is private by default, Moments is able to use fewer configuration options. Moments UI is simpler, cleaner and looks much more modern than Photo Station's. Photo Station's FR is a beast - there's no other way to describe it. It is a resource hog and creates so many false entries that it is a waste of time. Moments' version is a quantum leap forwards. It is very fast and seems to be free of the glitches that caused Photo Station to identify features in the landscape as faces. However, it has a fundamental flaw. It misidentifies people, so you end up with a group of photos linked to a person label that includes wrongly identified people. And there's no way to remove or relabel the incorrect entries. This renders the feature useless, so I turn it off. And, as every vendor on the planet knows but doesn't address, FR is only part of the solution to the challenge of People Recognition. Unless a person is shown full face or with a substantial partial face, they cannot be recognised. You will always have to manually tag people who are in profile or are seen from another angle, and Moments has no facility to tag these as people because it's only concerned with faces. That doesn't work for me this is another reason to turn FR off. Photo Station has some issues with geolocation, the most significant being that it frequently fails to find a match for the location you enter, forcing you to search by postcode or by panning the map, and then to manually move the marker. Having done so, you cannot edit the label to the one you want. Accept the old label and the marker moves back to the original position. In Moments, you don't search for a place. Instead it assumes that all images already have GPS coordinates and performs a reverse lookup to derive an address label for the image, and then it groups matching items together. That's great if you are using a smartphone with GPS, but very few DSLR cameras are GPS enabled. The vast majority of my photos have no GPS coordinates and I have to add those manually using Daminion. Again, there is no ability to edit the Moments label, which is unfortunate because they can be wildly inaccurate. For example the auto-applied label, United States of America, Utah, Washington County, Left Fork of North Creek is actually Zion National Park! And in the rural area where I live, the same, very inaccurate, label is applied to places within a 5 mile radius of each other which is crazy when GPS is accurate to less than a metre. Because of these inaccuracies I have disabled Places. Recognising the built environment is no better. A picture of the Eiffel Tower was labelled as "Architecture." 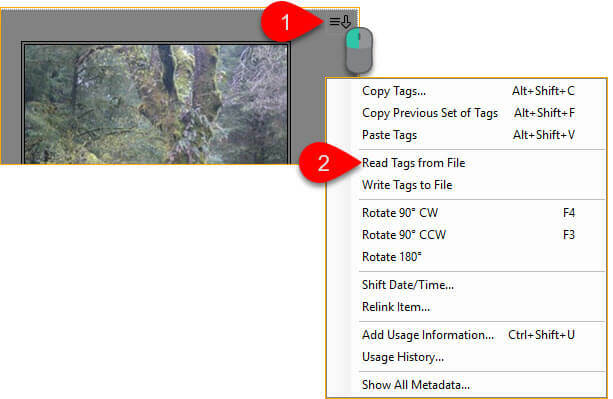 Automatic subject tags cannot be edited, and incorrectly identified items cannot be removed so, once again, this functionality is of little use for the serious photographer. To be fair, Synology is not alone in this. I tried the same photos with other apps from big players like Microsoft and Google and they all performed as badly. AI has a way to go before subject labelling is going to be useful for serious photographers. Whether it's Faces, Places or Subjects, automated tagging is currently only useful to the casual photographer. If all you are trying to do is organise a few hundred photos then you will probably forgive the occasional wrong label. What we have is a classic trilemma. The serious photographer needs a DAM app such as Daminion to enable them to manually tag their library. Auto tagging is free and fast but it is not accurate. Manual tagging is slower and not free, but it is accurate. So, as far as auto tagging is concerned it turns out that Moments is no more useful to the serious photographer than Photo Station. The good news is that, like Photo Station, Moments supports keywords embedded in the image files. And it recognises the same keyword set that Photo Station uses, so if you want to transfer to Moments, you do not need to rework the metadata. Accessing the keywords is a little different. In Photo Station the keywords are presented as general tags in a set of alphabetically sorted thumbnails. Moments also uses thumbnails but presents them in random order. Scrolling to find a specific keyword is almost impossible in a large library. The best way to find a keyword is to use the search function. Fortunately this is very fast, just like Photo Station, and you will see matching keywords as you type which is very helpful if you are not sure what search words to use..
Albums. An album is a collection of files that you select manually and assign a name to. You can add content to an Album retrospectively. You can't share folders, but you can put the contents of a folder into an album in a couple of clicks. In Photo Station you could create URLs that performed a seeded search of the public library. You can do that in Moments but they won't be public shares, you will need to login to see the search results. Not good. Shared links do not appear in any central library so you need to keep track of them separately, perhaps in Note Station. You could also create a public web page of your links. Or you could create a publicly shared Synology Office document that contains the links. Be aware that if you move shared content, the share link will break. If you turn that option ON, be aware that it will do exactly what it says and will scan and index every image or video in your My Drive area. It found and indexed my entire library of screenshots and gifs. Impressive but not what I wanted. It's a pity it's such a blunt instrument. It would be better if you could pick the folders to include / exclude. Tip: Copy your /photo share content instead of moving it. That will make it easier to switch back to Photo Station if Moments doesn't work for you, as well as protecting your library in the event of a technical problem with Moments. Any change, move, add or deletion that is made in Moments will be reflected in Photo Station. The Daminion Catalog will be out of sync until you rescan the folders. This would be a good use case for adopting Daminion Home Server. Moments could be a worthy alternative to Photo Station for the hobbyist user. Setup is so much easier, the UI more attractive, and sharing is mostly better than Photo Station. New releases are coming quickly and the issues that prevent me recommending it as a definitive alternative to Photo Station may be addressed. For now Synology Photo Station is king. I hope you found this guide useful. I review it periodically as the technology changes, and I am always open to ideas about how it could be improved. If you have any questions, please use the Comments section below or the Contact menu option.